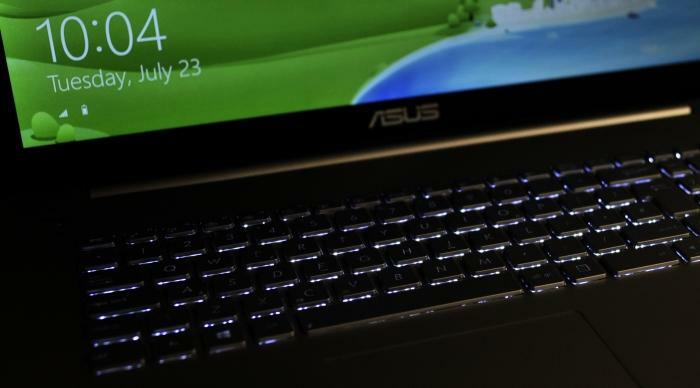 The first fourth-generation Intel Core i7 notebook that we've been sent by ASUS is a big one. In fact, it's a model that has no business leaving the home or small office that it's bought for. The N750JV has a 17.3in screen, a weight of 3.3kg, and it has an enclosed design that lacks an easy-access panel, which is something we're not used to seeing on units of this size. The enclosed design requires a star-shaped screwdriver to be used if you want to remove the bottom panel in order to tinker with the laptop's configuration, but what you get by default should be more than adequate for office and multimedia tasks, and even gaming. There is a 2.4GHz, Intel Core i7-4700HQ CPU (this is different from the 4700MQ that we've seen in other models, in that it offers virtualization technology and slightly faster graphics performance), 16GB of DDR3 SDRAM, and an NVIDIA GeForce GT 750M graphics adapter. Storage is handled by three devices: a 750GB Seagate system drive, a 1TB Hitachi secondary drive, and a 24GB SanDisk solid state drive for caching purposes that aids boot up and the launching of frequently-used applications. You can use this notebook easily as a desktop replacement thanks to this configuration, and it proved to be a very capable unit in our tests. In Blender 3D, it rendered our test file in 19sec; in iTunes it converted our WAV files to MP3s in 40sec; in HandBrake it turned our DVD file into an MP4 in 9min 6sec. The Blender time is spot-on for the frequency of the chip, while the iTunes time is a little faster than we expected. HandBrake is a few seconds longer than we expected, but we put that down to the storage being a little slow. In CrystalDiskMark, the system drive recorded a read rate of 103 megabytes per second (MBps), and a write rate of 102.8MBps, which are sluggish results. Even compared to the HP Envy 17, which has a similar configuration, the ASUS' storage results are over 10MBps slower. Graphics performance is good though. In the latest 3DMark, the GeForce GT 750M recorded 66508 for the Ice Storm test, 5333 for the Cloud Gate test, and 1461 for the Fire Strike test. The Fire Strike test is the most demanding, and its result in this indicates an ability to run many modern games. Physically, the N750JV has a wide chassis that supports a full keyboard and number pad, and it has a palm rest that's 115mm deep. The touchpad is large and centred just to the right of the space bar, and it felt smooth and responsive in our tests. It didn't allow us to perform any three-finger swiping gestures, though, even after we enabled this setting in the ASUS Smart Gesture driver. Two-finger scrolling, and Windows 8 swipe-in gestures worked well. The keyboard on our pre-production model came with a UK layout, so we can't comment on its key placement and key size (although the number pad and arrow keys are squished in to make everything fit), but we can say that the keyboard's backlight can make the keys hard to see at time. Unlike other keyboards we've seen recently, which allow white light to shine through the keys, the grey keys on this ASUS model have a soft purple filter for the light to shine through. This soft purple and grey combination doesn't provide enough contrast in some environments, and can make the lettering on the keys hard to see unless there is enough darkness around you. There are three backlight levels to choose from. Because the keys sit fairly high, it's easy to see the white source light under the keys, which can be distracting depending on how you're sitting. As for the typing experience, the keys have soft travel and responsiveness. In other words, they are fine for long typing sessions. The keyboard backlight can be visible under the keys depending o how you sit, which can be distracting. There is lots of space around the keyboard, and the power button on the right side is balanced in terms of looks by a programmable shortcut button on the left (we set it to bring up the default Web browser). A dot pattern is printed on the chassis that makes it look like there are large speaker vents around the buttons, and the 'Audio by Bang & Olufsun ICEpower' printing in the middle certainly makes you initially think that the dots might represent the speakers. In fact, the speakers for the this notebook are located on the underside of the laptop at the front, and despite being powered by Bang & Olufsun technology, the audio output from this laptop fell well below our expectations. In addition to the two speakers at the front, an external sub-woofer can be plugged in to the right side of the unit, which adds a little bit of bass to the overall sound. However, the sound seemed to be poorly balanced. When we fiddled with the balance control in the audio driver, the left and right speakers appeared to be playing different frequencies, rather than being set up as equal stereo channels. Basically, don't get this notebook if you want something with good built-in speakers. Acer's Aspire V7 was much better in this respect, as was Toshiba's Satellite P50t. That said, the ASUS does have an S/PDIF output, so, with the correct cable, you could plug this notebook into a good pair of speakers or a stereo system to get better musical enjoyment. Connectivity along the sides of the notebook is plentiful, with the right side having the aforementioned S/PDIF and headphone port (it's a 3.5mm combo jack), a microphone port, the sub-woofer port, and two USB 3.0 ports. There are two more USB 3.0 ports on the left side, a PCIe-based SD card reader, a VGA port (breakout cable required), a full-sized HDMI port, and a Gigabit Ethernet port. There's nothing on the back because the way the hinges are designed means that the bottom of the screen tilts down over the spine. Air vents along the spine are exposed when the lid is open, and fans push warm air through them. The left side has the networking and video ports, as well as two USB 3.0 ports, and the SD card slot. Audio ports can be found on the right side, along with a couple more USB 3.0 ports, the Blue-ray writer, and the connector for the supplied external sub-woofer. The screen has a Full HD resolution and a matte finish (it's not a touchscreen). It provides plenty of contrast and brightness, and it looks good when display photos and videos. We did notice some slight flickering, which was due to a low refresh rate, but it appeared to go away once we changed the graphics adapter setting to 60Hz. Because it's such a big screen, the Full HD resolution looks a little low on it, which is to say that icons and text appear quite large. It would be great to see a notebook such as this with a finer resolution that could make use of the large screen area. With a 3.3kg weight and large width, you probably won't want to use the ASUS N750JV on your lap too often, nor take it out on the road. If you did want to use it on batteries, though, it would give you fairly good life. In our rundown test, in which we disable power management, enable Wi-Fi, maximise screen brightness, and loop an Xvid-encoded video, the N750JV lasted 3hr 1min. It's a little more than the HP Envy 17 got in the same test. Other features of the N750JV include a Blu-ray writer, dual-band Wi-Fi, Bluetooth, and a webcam. Along with all the other features we rattled off earlier, the N750JV definitely has enough to please most users' needs, and we think it's suitable for demanding office and multimedia work, as well as gaming (though you won't be able to play all games in high detail and at the native resolution of the screen). We just wish the keyboard was a little more refined, and that the audio output was of a higher quality, especially since the latter is a feature that is being pushed by ASUS. Then again, we looked at a pre-production unit, so maybe the retail units will have better sound.